ThruSpace is a unique 3D puzzle game that will put your spatial awareness and reaction times to the ultimate test. Steer a Keydron, a simple geometric shape, at high speed through gaps in a series of walls, rotating it to the correct angle to fit through: the more walls you pass through the more you score, plus, you can pick up crystals to boost your points. 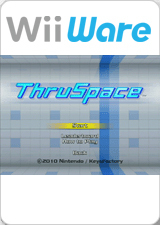 The graph below charts the compatibility with ThruSpace since Dolphin's 2.0 release, listing revisions only where a compatibility change occurred. This page was last edited on 22 January 2018, at 02:24.